Last year, I unsubscribed from every newsletter in my inbox. I really need to do this again. I don’t even remember why I’m signed up for Manuka Doctor, but they send quite a few discounts through. Which, when you’ve not bought anything for a while and you are in that MUST SPEND mood, is dangerous. In my defense, I got all of these for around £45 – and I had £30 in my PayPal I’d forgotten about. So practically free right? The apiclear range is aimed at problematic and spot prone skin. Ever since starting on Yasmin for my acne, my skin is actually quite good, but I do get spots when I eat junk food, drink, and am due on my period. So, kinda a lot of the time! I love a good face mask, I have tonnes actually; this is good in that I can leave it on my face for hours and my skin not dry out, and I feel it helps even out small marks and blemishes, but in terms of is it going to cure you of all ailments? Not in my opinion. Nothing special, but nice for a Sunday morning. I can’t believe I didn’t ever used to use a toner! Seriously, if you don’t use one you need to. I mean, obviously not really but if you ever get dry or tight skin, or have leftover residue after taking off your makeup, it helps to refresh your skin and (IMO) prepares the skin better for absorbing serums and moisturisers. This is nice and refreshing, and I do think it has helped to keep my skin clear of spots whilst using it. My only issue is that past toners I’ve used have exfoliating properties and I find they’re better at keeping my skin brighter. I’m tempted to buy this again for morning use, and an exfoliating toner for evening use. Totally acceptable right? I love this, it’s definitely my favourite out of everything. Unlike my usual bed time oil (The Body Shop Vitamin E Serum in Oil), this is light enough to be used every night. I have normal to combination skin, mostly normal, and this hydrates enough that I don’t need to use a night time moisturiser, yet it’s not greasy so my skin doesn’t feel gross for ages. Can’t recommend it enough if you want an oil that evens out skin tone and hydrates without being heavy! Erm, so yeah obviously not a necessity but I want bigger lips (like basically everyone these days). I’ve used this a few times, it stings slightly for a few minutes but nothing you can’t tolerate (almost like you’ve eaten a hot curry) and it does swell your lips up to make them bigger. Not a huge difference, but if you’re looking for just a little pout it would probably do! 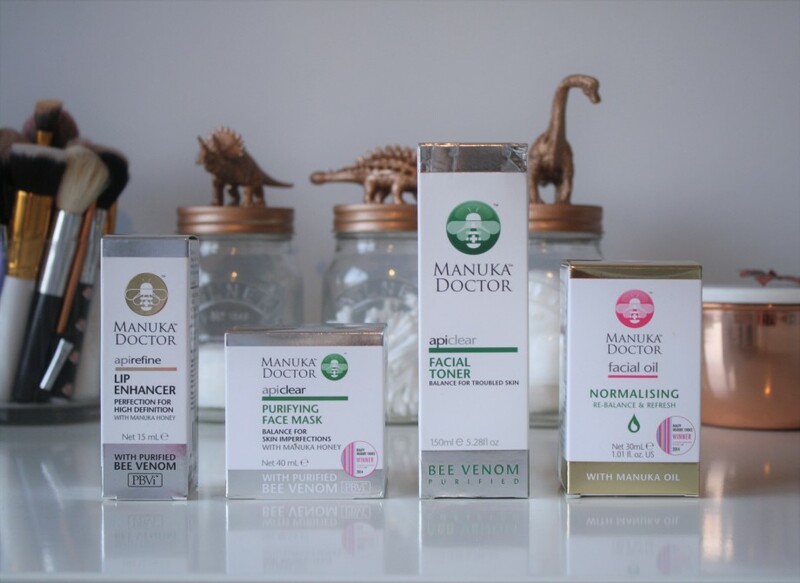 Overall, I think Manuka Doctor is a decent brand, although a little pricey for some products. However, they do discounts all the time (I still haven’t unsubscribed…) so you can normally get a good deal. They also do introductory sample kits, which is great if you want to try out products without the initial high investment! I love the facial oil and will definitely be repurchasing, and I’ll probably get the toner again next time it’s on sale. Tried any of these? What’s your current skincare favourites? Let me know!